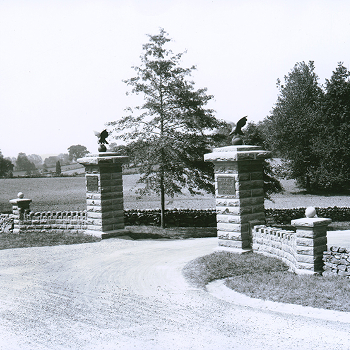 Above Image: The original gateway to Hancock Avenue at Taneytown Road, which will be rebuilt during the Cemetery Hill, Ziegler's Grove project over the next two years. May 2015 - Funding has now been granted to complete the restoration of Ziegler's Grove and the Cemetery Hill area to the 1863 appearance. The $1.3 million dollars will begin in the fall of 2015 and last for two years with a new walkway from the Cemetery Gate to the High Water Mark, a reduced parking area, landscape changes, and replacement of battle markers to their original positions. Grand opening to the Gettysburg Heritage Center museum shows a 3-d component to fabulous exhibits and the best context film in Gettysburg today. July 2, 2014 - Yes, it's true, that whatever changes are made in the town of Gettysburg during the next 150 years, they will always take a back seat to the main reason millions of visitors traipse across the fields surrounding the town. It is a battlefield that saw, what many think, the most important military engagement in the nation's history and the reason why the United States did not break apart in 1863 and become two nations. It's hard at times to fathom what that means, particularly if you haven't been there. It's hard to explain just what the vistas and museums and battle walks will mean to you once you've come. Come and feel that for yourself. And now, in this first year past the first 150 years, there are three changes brewing in their various states of grace, to help you interpret the battlefield and the town. One takes it's cue from getting the landscape back to its original view, another protects an iconic landmark building of the battlefield as well as returning the ground around it to more pristine turf, and the third reconfigures an americana icon, turning wax into a heritage center experience that will wonder and amaze a new generation with high definition films, 3-D stereographs, stories of the town and battle, plus a balloon ride above that renewed landscape so you can get a bird's eye view of it all. For the veteran visitor to the park, the scene above, in July of 2014, seems more than a bit odd. In fact, it can take a bit of time to reorient yourself to just where you are. But the hay covering the newly sown grass is actually the parking lot and right side of the old Visitor Center area. 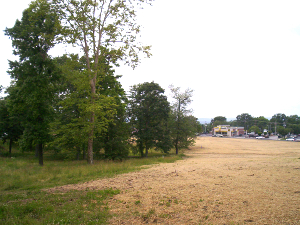 Eventually this area will grow into a meadow and may eventually contain a pathway taking you from the High Water Mark (left of the photo above) to the Gettysburg National Cemetery (behind left). For now, it's the vista from the Cemetery as you go down Taneytown Road. There is still a parking lot, the old Cyclorama lot, in the area for your High Water Mark or Cemetery visit, although it will be reduced from 141 cars to 54 cars, which will be fine, according to a park traffic study on 90% of visitor days. If you're there on one of the others in the future, you may have to take the Gold Line Shuttle, free from the Visitor Center parking area, or park in the grass lot below the Park Ranger headquarters house across from Meade's headquarters. 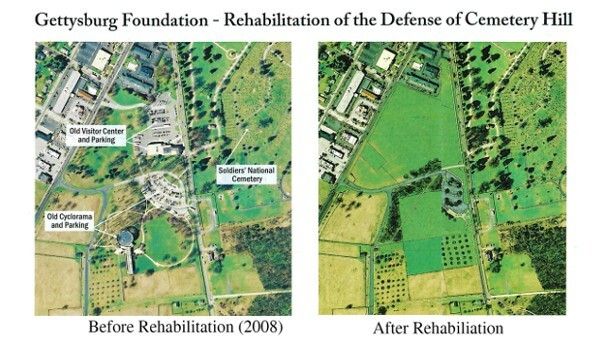 Below is a drawing of the before and after schematic of the Ziegler's Grove and Cemetery Hill area. Boy, for those that recall the old Visitor Center and all that parking, it will be a significant change to go back in time to 1863, but more appropriate. On the other side of town, as described in a ceremony to announce the preservation effort there on July 1 by the Civil War Trust, Department of the Interior, and other dignitaries from the state and park, General Lee's headquarters will be transferred to public hands. 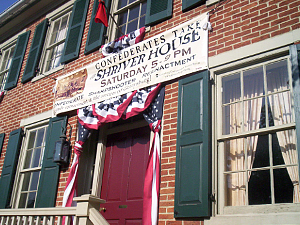 General Lee's headquarter's has been in private ownership since the war, even at one time owned by Thaddeus Stevens (although that ownership may have been in proxy). 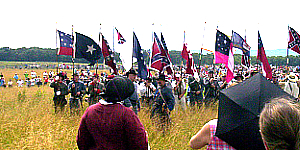 Since then the land around has been developed with an inn, even since the days of the reunions of Gettysburg veterans. Well, now the Civil War Trust, as well as the Gettysburg Foundation, and eventually the park itself, will take title to land on both sides of Route 30 and begin the process of restoring the ground around the headquarters to its original appearance. So we'll be saying goodbye to americana from the 20th century and hello to an enhanced american treasure of the 19th. We do feel a bit nostalgic about that for some reason. Plans are still being developed as to what and when for this restoration. The headquarters and grounds are still in the hands of the Civil War Trust. Photo above: Lee's headquarters in 2014. The appearance of the building may not undergo too many changes, but the landscape around it will be restored to its 1863 appearance. The changes made in the old Civil War Wax Museum are breathtaking and in the process to be even more so, but for now, the indoor exhibits have had their grand opening and boy, are they great! Let's start right off. The exhibits are one of the most unique and creative examples of using space and technology to convey the images, most in 3-d (they use stereographic photography from 1863 updated to 3-D film projection to great effect), that detail the battle and scenes of the town that suddenly saw 160,000 men fighting at every turn. Done by staff and construction crew with no high priced exhibit technology firm in tow, Tammy Myers and her minions have put together a display that rivals, and even surpasses on the pure exhibit side, the work of Bob Rogers at the Lincoln Presidential Museum in Springfield. No, there's no IMAX or holavision magic, but it's a grand achievement for this musuem in transition for the next one hundred and fifty years. And although it's not IMAX, the film that accompanies the exhibits mentioned above contain a great orientation to the battle, town, and park. In many ways, this film, created in part by the Civil War Trust, picks up where the old Electric Map left off. Folks, this is the best film about the battle of Gettysburg, the park, and town in the whole town of Gettysburg. Do not miss it! Congratulations, Gettysburg Heritage Center, you've done good. Geez, a whole lot better than good. And I hear there's more to come. 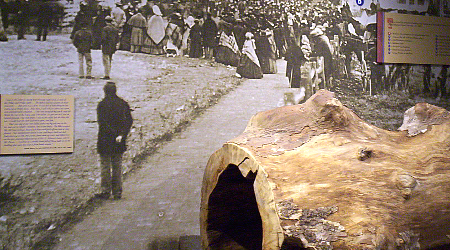 Photo below: One of the exhibits in the Gettysburg Heritage Center is a portion of a witness tree, which had been in the town of Gettysburg during the battle in 1863. Prior to 2008, the visitor center along Taneytown Road, within Ziegler's Grove, was the iconic building of the park. It was the location where almost all visitors to Gettysburg came first, then likely took the tour of the Gettysburg National Cemetery, which was just across the street. It was built in 1921 and served the park into the spring of 2008. The visitor center was not built by the Park Service, but by the Rosensteel family, who had been collecting and providing orientation to the park for decades. The National Park Service bought this building in 1963, along with the Electric Map, which was in the rear. Oddly, the Electric Map is now in Hanover, Pennsylvania, although we're not sure if it's open for business yet. Now being converted back to meadow after removal of the old Visitor Center and its parking lot, Ziegler's Grove will undergo some additional modifications over the next several years, likely including a historic visitor path that will wind from this location across from the National Cemetery to the High Water Mark. There are also monuments that will be replaced now that the building and parking lots have been removed. 1. In the Past and Ongoing. There has always been a pull and tug in Gettysburg amidst providing visitor services and preserving the battlefield. Ziegler's Grove and Lee's Headquarters are only the two most recent examples. At one time, the land where the current visitor center sits was an amusement park. There was a Stuckey's in the middle of Pickett's Charge. Camp Letterman, along Route 30 east of town, was the location of the hospital camp where tens of thousands of soldiers were administered to after the battle, all the way into the fall of 1863. That land has not been preserved. The fight for preservation continues. 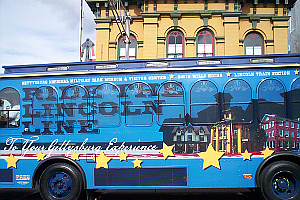 Whether this is your first or fifteenth visit to Gettysburg, there's always tons of things going on. 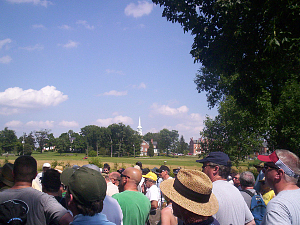 Gettysburg National Military Park has about 15 different Battle Walks each day of the summer season, including a Pickett's Charge walk about once a week or once every two weeks. You can check their website if one's coming up. Check the 3:30 Battle Walk schedule. It covers a different walk per day. 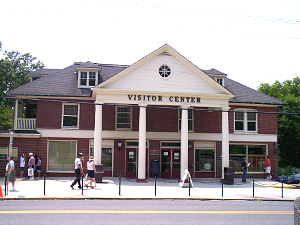 The visitor center is open all year round with a museum, movie, and Cyclorama. You will pay for those. Plus, the entire town bustles with activity, most of it Civil War oriented, at all times. Beyond the new Gettysburg Heritage Center, there are nearly one dozen private museums dotting the town, many in the Steinwehr Avenue area closest to the battlefield itself. Photo above: Reenactors walking toward the High Water Mark during the 150th Anniversary of the Battle of Gettysburg. There are Pickett's charge battle walks several times per week during the summer season at Gettysburg. 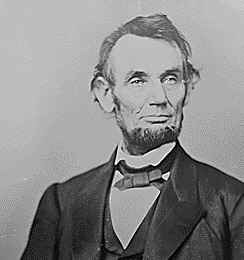 Photos courtesy of the Library ofCongress, National Archives, National Park Service, americasbesthistory.com and its licensors.